Bradenton Police Dept. 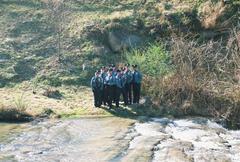 Explorer Post has a few available spots for career-minded teens. Do you know of a teen who is interested in a career in public safety or the military? The Bradenton Police Department has a program that offers many opportunities for local youth to gain first-hand knowledge of law enforcement. Chartered by the Boy Scouts of America, exploring is sort of a combination of scout troop, ROTC, and police academy all rolled into one. The five areas of emphasis are: Career Opportunities, Life Skills, Citizenship, Character Education and Leadership Experience. To this end, the Explorers participate in community service events, assist in decision-making for expenditures, raise funds, elect officers, learn and practice Robert's Rules of Order, attend training, travel, compete against other posts in law enforcement scenarios and more. The youth have the opportunity to learn First Aid and CPR/AED, join the Honor Guard, learn gun safety and learn to safely and accurately shoot pistols and rifles. A favorite activity of most is the annual trip each winter to Gatlinburg, Tennessee where they join about 3,000 others who come from surrounding states to compete in the Winterfest Competition. Since this is a competitive group, a strong sense of "teamwork" and commitment is required. Explorers are expected to attend their weekly meetings and training as well as some weekend training camps. Members must be ages 14 - 20 and have successfully completed the 8th grade. They must maintain a minimum of a C average in school with no failing grades. They must have no criminal history, and be of good moral and ethical standing. The post meets every Tuesday night from 7 - 9 PM at the Bradenton Police Department District II substation at 1404 14th St. W.
Potential members are invited to attend three meetings prior to submitting an application for membership. For more information or to make arrangements to observe a meeting and meet the Explorers, please contact Sgt. LJ Millard at lj.millard@cityofbradenton.com or (941) 741-3041.